For those of you not familiar with the cartoon: JEM is the story of a small town girl from California named Jerrica Benton (in this case, played by Aubrey Peeples from "Nashville") who has the voice of a superstar, but her talent is overpowered by the fact that she is super shy. 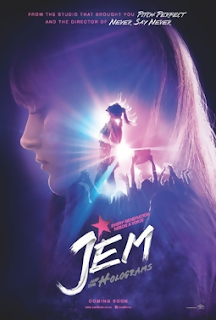 She runs out of options when her back is pushed up against a wall, and is forced to become her alter-ego, JEM. Her sister, Kimber (Stefanie Scott from Disney's A.N.T Farm), uploads the video of her singing to YouTube, and the social media world goes crazy! Jerrica tells legendary music executive/greedy CEO of Starlight Records, Erica Raymond (Juliette Lewis) that she will sign with her if she can bring her sisters (Kimber and her two foster sisters, Aja and Shana). Long story short, I was ready to not like this movie just because I watched the cartoon religiously as a kid, but I ended up loving this movie. I think Aubrey is very likable and relatable, and I think they actually did a good job with the story-line too - it wasn't as cheesy as I was expecting it to be, and I do think the fans should give it a chance. I also think that adding Molly Ringwald to the cast was a nice touch (love the 80s throwback near the end lol). I recommend at least seeing it, and then deciding for yourself. Let's just put it this way, it was made by the same studio that did "Pitch Perfect 2", and I thought it was done much better.